Frilsham's Defibrillator is located in the phone box close to the end of Beechfield - postcode RG18 9XF. In Frilsham we have always called it "The Defibrillator" but the correct term is "Automated External Defibrillator" or "AED". 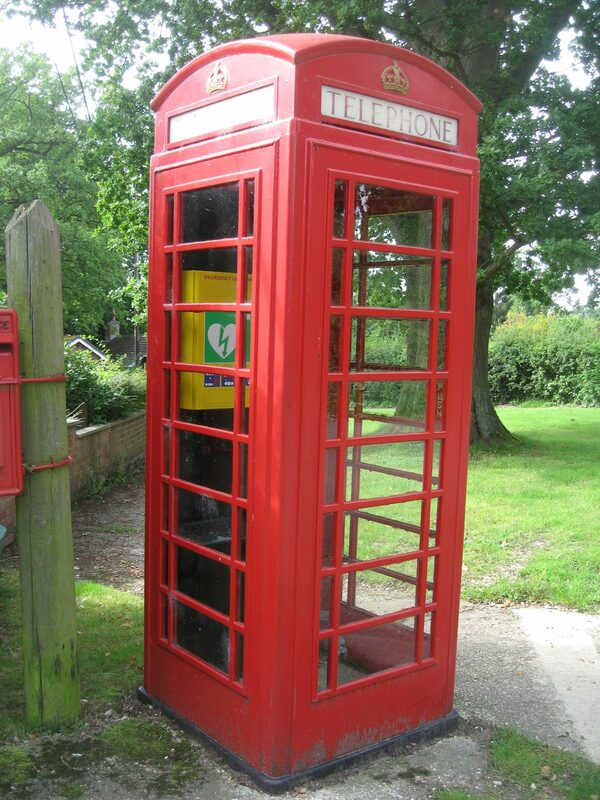 The call centre knows there is a defibrillator in Frilsham - you will be given the code to unlock the cabinet. One person stays with the patient - the call centre tells them what to do and someone else goes to get the defibrillator - take the code with you so you can't forget it. The defibrillator is in a small bag in the cabinet - it is easily portable. You do not need to be trained to use the defibrillator - it tells you what to do. Training will just make you more confident once you have seen a defibrillator in action. IF YOU ARE NOT TRAINED AND THE NEED ARISES YOU CAN STILL USE THE DEFIBRILLATOR TO SAVE A PERSON'S LIFE. How did Frilsham get a defibrillator/AED? About a year before it was installed some Frilsham residents had a visitor who collapsed on their doorstep and initially seemed unresponsive. The ambulance took 40 minutes to arrive... Fortunately there was a happy ending and their friend made a full recovery but they had heard about defibrillators - should Frilsham have one? Their research soon discovered that defibrillators were being installed in cities, towns and the countryside up and down the country. Frilsham's phonebox was looking for a use now the phone had been removed - it was the perfect location. Funds were raised from the West Berks Creating Capacity Fund, Greenham Common Trust and a village market to purchase the defibrillator from Community Heartbeat. Frilsham Parish Council has taken ownership of the defibrillator and covers the cost of electricity. 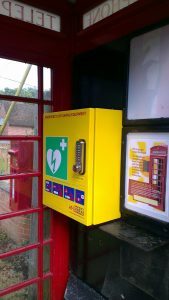 Amusingly the defibrillator itself does not need a power supply - it has long lasting, regularly tested batteries - the power is for a light in the phonebox! A free training session was provided by the South Central Ambulance Service attended by many villagers in November 2013. If you are interested in training look out in the Broadsheet, this website or the local press for a session - they happen from time to time. It was not long before Hampstead Norreys had a defibrillator installed and then Yattendon a couple of years later. After 4 years ours has never been used but it is checked regularly by volunteers and is there if needed.